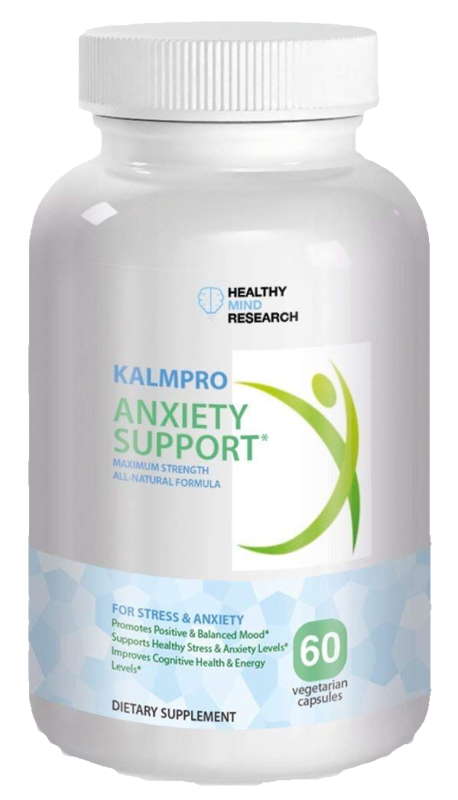 KalmPro, by Healthy Mind Research, is a natural formula that helps the body in it’s combat against the effects of stress and anxiety. Its blend of clinicaly tested botanicals, amino acids, vitamins, minerals and adaptogens has been exclusively selected by Dr. Carlo Carandang and is designed to help the body cope with the effects of everyday stress and anxiety, including insomnia, lack of concentration, mood swings and fatigue. Fight the effects of stress and take control of your mental health today! Gamma-AminoButyric Acid (GABA) is an inhibitory neurotransmitter in the central nervous system (CNS), and acts to place the brakes on your hyperactive fear circuits. L-theanine is an amino acid that is able to cross the blood-brain barrier and stimulates the brain’s alpha waves, encouraging a relaxed state of mind - all without causing drowsiness or fatigue. Passionflower acts as a monitor for GABA levels and moderates the brain’s activity levels. Too much activity has been linked to anxiety, passionflower ensures your levels are stabilized. Valerian is a potent herb that encourages a relaxed state of mind while balancing your brain activity levels. Lemon Balm has been shown to be effective in decreasing corticosteroid levels and reducing stress hormones. B Complex Vitamins reduce anxiety and depressive symptoms. Magnesium helps for anxiety and as an augmenter for depression. Rhodiola helps for Generalized Anxiety Disorder and mild to moderate depression. Ashwagandha decreases anxiety by stabilizing the body's response to stress. Chamomile is effective for Generalized Anxiety Disorder by enhancing GABA and serotonin. Skullcap reduces anxiety by enhancing GABA and is a GABA receptor agonist. Bacopa reduces anxiety and improves memory and concentration. St. John’s Wort is a well-known natural treatment for depression. 5-HTP is the precursor to serotonin and is effective for depression. What is Kalm Pro by Healthy Mind Research? Kalm Pro is a natural supplement for anxiety, formulated by a psychiatrist. How does Kalm Pro work? Kalm Pro works by calming the fear circuits in the brain via a blend of natural herbs and dietary supplements. When is the best time to take Kalm Pro? Take 2 capsules daily at bedtime. Is Kalm Pro FDA approved? 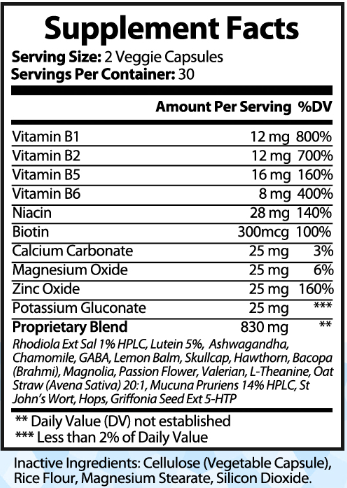 The FDA is not authorized to review dietary supplement products for safety and effectiveness. But we do utilize Good Manufacturing Practice (GMP). Kalm Pro's capsules are made of a plant product called cellulose. There are no animal by products in our supplement. When first starting Kalm Pro, take 1 capsule daily for 1 week, then increase to 2 capsules daily. Kalm Pro is produced from a GMP certified supplement manufacturer. Are there side effects to Kalm Pro? Sedation is the main side effect, so therefore it is recommended that it be taken at bedtime. How quickly will Kalm Pro ship? It will ship in 2 to 3 business days. 4 Stars: This worked for my relative that has suffered from OCD and Bipolar for years. She has suffered through countless medications prescibed by psychiatrists, which made her feel like a zombie. Much of her memory was lost due to these harmful drugs. She has been using this product and also vitex ( To balance hormones) and also MilkThistle drops (for depression) She says using the drops she can actually feel the drops lifting her depression. She also takes Garcina (for appetite control) gaba at night, cinnamon ( for blood sugar control) and vits c d and e. Also b vit complex with 1000 mg of vit b12. The product developed by this psyciatrist, has been amazing. And its actually helping my relative! Good luck everyone! 5 Stars: Provides the help that I need to cope with the daily stress and the anxiety without the peripheral side effects the accompany other medication. Received in the condition and the time frame stated in the ad. 5 Stars: This product works. I suffer from ptsd which includes anxiety and depression, so that being said, I notice a huge difference when I'm having the anxiety. I suppose if you do not have actual anxiety you may not notice a difference. I haven't noticed side effects, but anything feels better than the anxiousness, heart racing, can't breathe feeling that the ptsd offers. I would recommend this to anyone who truly needs an anti anxiety medicine. 5 Stars: I was actually very skeptical when I ordered this product. I was looking for something other than prescribed medications to help with my anxiety and panic attacks. I've been taking this for almost a month now and am pleased with the results I'm seeing. Most days I can take just one pill in the morning and be fine. On days that really push me, I take a second pill in the evening. One difference between the prescribed meds I was taking and the KalmPro is not being as tired. I do feel like I actually want to do something. I don't feel so drained (unless it's from work or not enough sleep). I would honestly recommend anyone who is looking to help with their own conditions to give this a try. 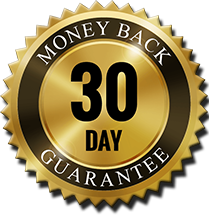 We are so confident that Kalm Pro will work for you that we offer a 30 Day 100% satisfaction guarantee. If you’re not happy, send it back for a full refund, no questions asked. Dr. Carandang, an anxiety expert, is a Fellow of the American Psychiatric Association and a licensed physician. He has seen patients for over 15 years, with extensive experience treating patients with anxiety and depression. Dr. Carandang has been on the medical staff of multiple hospitals, including the University of Texas Medical Branch Hospitals, Maine Medical Center, Spring Harbor Hospital, Southern Maine Medical Center, and IWK Health Center. He was on the faculty at two medical schools, teaching medical students and residents, first as Clinical Assistant Professor of Psychiatry at the University of Vermont College of Medicine, and most recently as Assistant Professor of Psychiatry at Dalhousie University Faculty of Medicine. Dr. Carandang was Assistant Editor for the Journal of the Canadian Academy of Child and Adolescent Psychiatry, and was an ad hoc reviewer for numerous other psychiatry and medical journals. 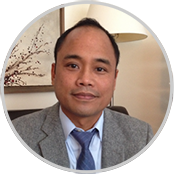 Additionally, Dr. Carandang has extensive experience with research in the areas of anxiety, depression, and psychopharmacology, as evidenced by his 34 publications and 6 research grants to date. He has also published a book, Anxiety Protocol, which is a self-help book for anxiety. Finally, he is the founder of the leading clinical anxiety website AnxietyBoss.com, which has reached over 4 million people to date. GENERAL No content on this site may be reused in any fashion without written permission of Healthy Mind Research. The information and facts are intended to help and support, not replace, the relationship that exists between you and your doctor. KalmPro™ - Healthy Mind Research – All rights reserved. LEGAL The statements on this site have not been evaluated by the FDA. This product is not intended to diagnose, treat, cure, or prevent any disease. Information is presented for educational purposes only and is not intended to replace the advice of your healthcare professional. Consult your doctor or health professional before starting a treatment or making any changes to your diet.